This Interstate 124 reassurance marker was posted by November 1999 and located on the transition ramp from I-24 east to U.S. 27 north. Removed by 2003, it was the lone northbound shield at the time. Photo taken by Philip Hart (11/21/99). U.S. 27 lines a freeway north from the Big Scramble Interchange with Interstate 24 in Chattanooga to Soddy-Daisy and Tennessee State Route 111 by Chickamauga Lake in southeastern Tennessee. The southern portion of the route, between I-24 and the Olgiati Bridge, doubles as unsigned Interstate 124. The interstate portion runs between Downtown and Westside Chattanooga. Interstate 124 signs were not re-installed when the major directional interchange improvements [at I-24] were made some years ago. 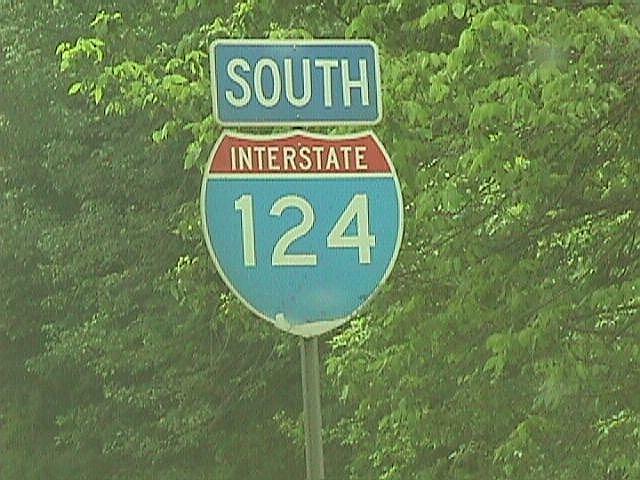 A southbound reassurance marker for Interstate 124 once stood just beyond the P.R. Olgiati Bridge adjacent to a former ground level sign for Exit 1C. Photo taken by Jim K. Georges (05/98). Another possible reason why TDOT dropped signs for Interstate 124 was due to the northward extension of the U.S. 27 freeway beyond the Signal Mountain interchange with U.S. 127. 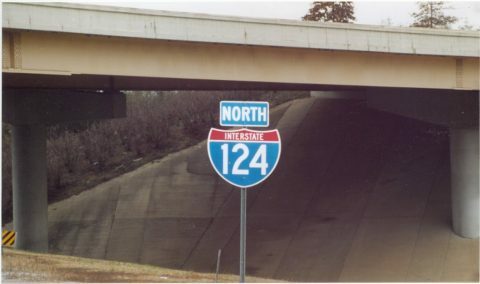 Scott Boles wrote in 2003 that the only portion of the U.S. 27 freeway in southern Tennessee that did not meet Interstate standards at the time was the section assigned to Interstate 124. The contract to bring Interstate 124 to modern safety standards was eventually awarded by November 2015 at $126.3-million. It was the most expensive project in TDOT history at the time. Construction includes the redesign of interchanges with Martin Luther King Boulevard and 4th Street, the elimination of the S-curve at 4th Street, and new frontage roads. Additionally crews will expand the Olgiati Bridge by a lane in each direction. Design work on this project started in 2006 and rights of way were purchased in 2015.13 Work on the 2.3-mile project wastargeted for completion on July 31, 2019,8 but later amended to January 2020. Work on the northbound lanes for I-124/U.S. 27 was completed first, allowing crews to shift southbound traffic to the new roadway with two-way traffic. Construction on the southbound lanes, the new exchange at 4th Street and MLK Boulevard continues from 2018 to 2019. Final paving and striping work wraps up from late 2019 to January 2020. 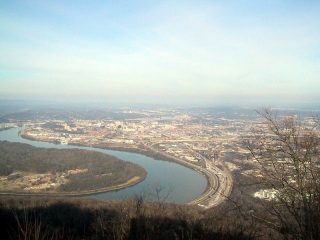 Interstate 124 and Downtown Chattanooga from Point Park on Lookout Mountain. I-24 straddles the Tennessee River east into the Big Scramble Interchange with I-124/U.S. 27. Photo taken by Eric W. Vander Yacht (12/02). Interstate 124 opened initially between West 9th Street (M.L. King Boulevard) and the Olgiati Bridge. By 1964, I-124 was extended southward to the new stretch of I-24 leading east. 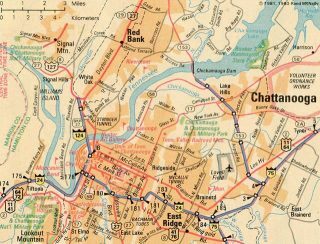 As approved by AASHTO on June 26, 1985, U.S. 27 was relocated from the surface route between East Lake/Clifton Hills in Chattanooga to Red Bank onto an overlap with I-24 through Southside and I-124 by Downtown. 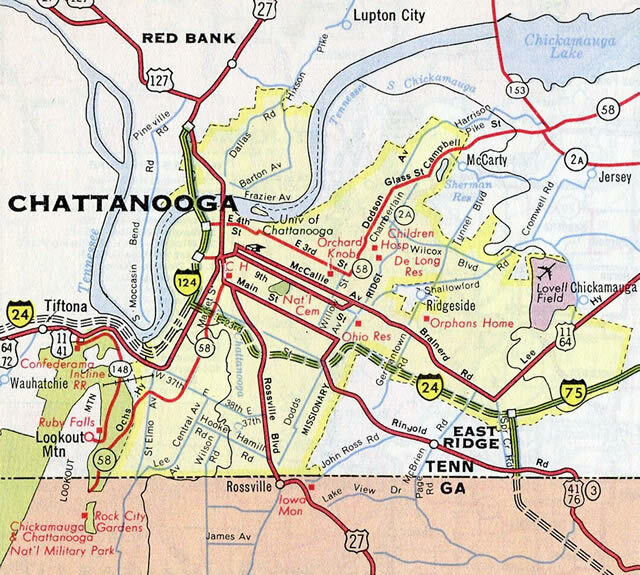 The interstate portion of U.S. 27 never extended all the way to U.S. 127 (a distance of approximately four miles), even though the Rand McNally Northern American Road Atlas from 1980 to 1987 mistakenly showed it beyond the Tennessee River. 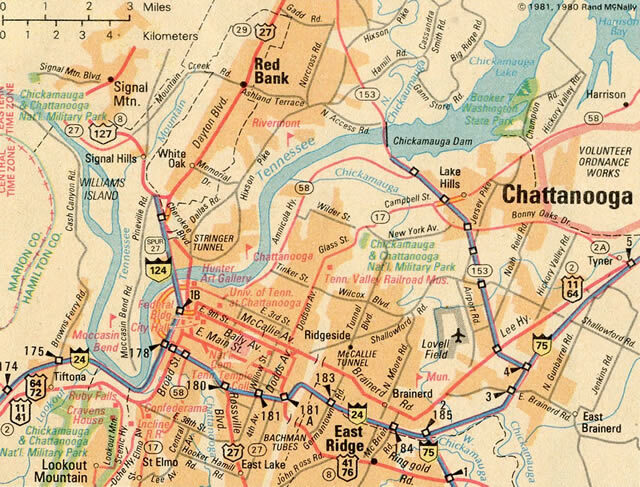 I-124 was removed from the Chattanooga inset in the 1988 edition. The U.S. 27 Reconstruction in Downtown Chattanooga project rebuilt the trumpet interchange (Exit 1C) joining Interstate 124 with Fourth Street into a modified diamond interchange. 4th Street (SR 389) connects the freeway with the north end of the central business district. Photo taken 01/21/13. U.S. 27 navigated through a narrow S-curve at the exchange with 4th Street along side AT&T Park. 2016-20 construction here straightens out the freeway and widens I-124 to six lanes over 4th Street and eight lanes across the Olgiati Bridge. Photo taken 01/21/13. Interstate 124 ends and U.S. 27 continues north across the Mayor Peter Rudolph “Rudy” Olgiati River Bridge over the Tennessee River. 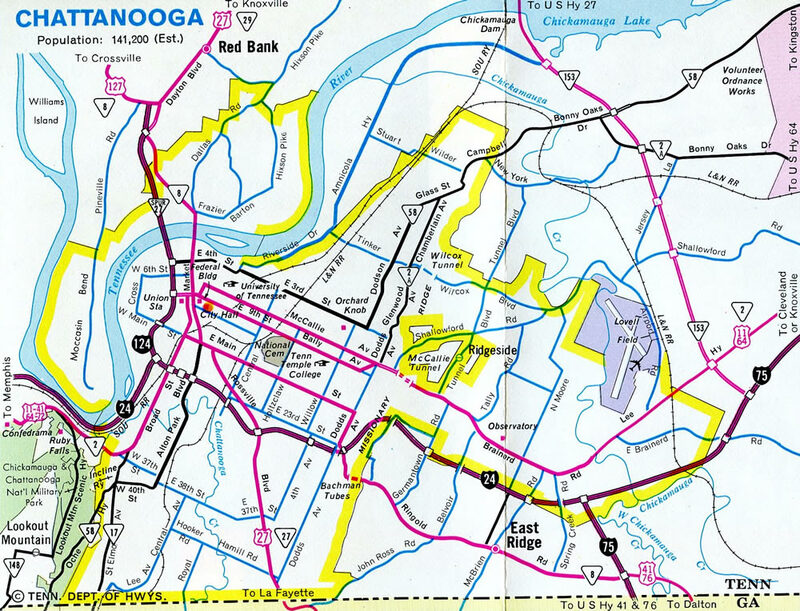 Subsequent interchanges are unnumbered as U.S. 27 ventures north to Hill City in Chattanooga and Red Bank. Photo taken 01/21/13. U.S. 27 south crosses the Tennessee River from Hill City to Downtown and Westside Chattanooga on the Olgiati Bridge. The freeway heads southward to 4th Street (Exit 1C) and Martin Luther King, Jr. Boulevard (Exits 1B/A) as unsigned Interstate 124. Photo taken 01/21/13. The trumpet interchange (Exit 1C) joining Interstate 124 and U.S. 27 with 4th Street (SR 389) east into Downtown was replaced with a modified diamond interchange in 2019. Photo taken 01/21/13. The Downtown Chattanooga skyline comes into view as Interstate 124 & U.S. 27 enter the S-curve by AT&T Field and 4th Street. Construction through January 2020 straightens out the curve here. Photo taken 01/21/13. Construction consolidated the succeeding ramps for SR 389 / 4th Street (Exit 1C) and Martin Luther King Boulevard west (Exit 1B) into a single ramp as part of the U.S. 27 Reconstruction in Downtown Chattanooga project. The loop ramp (Exit 1A) for Martin Luther King Boulevard east into Downtown is retained. Photo taken 01/21/13. Milepost one appears along the I-124/U.S. 27 southwestern curve over 12th Street. An unnumbered three-wye interchange joins the freeway with Interstate 24 in 0.75 miles. Construction underway from 2016-20 expands the southbound freeway between three and five lanes. Photo taken 01/21/13. Lookout Mountain, home to Chickamauga and Chattanooga National Military Park, rises to the south as Interstate 124 & U.S. 27 wind southwest across Main Street and Riverfront Parkway. Forthcoming I-24 east ends in seven miles at Interstate 75. Westbound I-24 straddles Raccoon Mountain south into north Georgia. Photo taken 01/21/13. Unmarked here, U.S. 27 combines with I-24 east for two miles from the south end of Interstate 124. U.S. 27 leaves the Interstate system at Exit 180 for Rossville Boulevard to East Lake/Clifton Hills and Rossville, Georgia. Photo taken 01/21/13. U.S. 27 south joins a c/d roadway along Interstate 24 east at the off-ramp for U.S. 11-41-64-72 (Broad Street) at Southside Chattanooga. 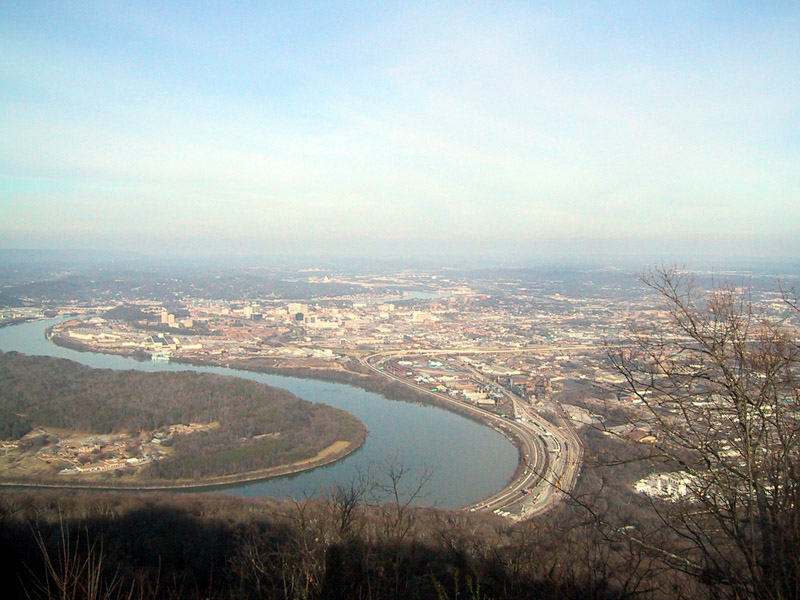 The four US routes lead motorists south to Alton Park and St. Elmo in Chattanooga and Lookout Mountain to the west. Photo taken 01/21/13. Milepost zero for the U.S. 27 freeway stands at the gore point connecting I-124 south with the eastbound c/d roadway (Exit 178) along Interstate 24. Photo taken 01/21/13. This diagrammatic sign replaced a pair of separate panels for Interstate 24 on the curve preceding the Main Street on-ramp. The overhead here was damaged when a vehicle struck the left side of the sign by 2007. A replacement was made by 2008. Photo taken 06/18/05. U.S. 27 north combines with Interstate 24 from Rossville Boulevard for a brief overlap west to unsigned I-124 (Exit 178). Photo taken 06/25/12. A distributor roadway (Exit 178) separates traffic from I-24 west to Market Street north for Downtown, 21st Street west for U.S. 11-41-64-72 (Broad Street) to Lookout Mountain and the U.S. 27 freeway leading north to Hill City and Soddy-Daisy. Beyond Interstate 124, I-24 travels westward 11 miles to the north end of Interstate 59. Photo taken 06/25/12. Three lanes partition from the Interstate 24 westbound mainline for U.S. 27 & I-124 north to Downtown Chattanooga. Succeeding ramps quickly depart for Market and 21st Streets while U.S. 27 north parallels I-24 west to Chestnut Street. Photo taken 06/25/12. Continuing west on the c/d roadway, the next off-ramp connects with SR 58 (Market Street) north to adjacent U.S. 11 & 64 (20th Street) at Southside Chattanooga. U.S. 27 north stays west another 0.6 miles along side I-24 to I-124. Photo taken 06/18/05. A loop ramp follows onto SR 58 (Market Street) south through Alton Park in Chattanooga and 21st Street west to U.S. 11-41-64-72 (Broad Street). The four US routes overlap along Broad Street south to St. Elmo, where they turn west to encircle Lookout Mountain. Photo taken by Chris Patriarca (07/14/03). Interstate 24 straddles the Tennessee River to the south of Moccasin Bend on the two mile approach to I-124 and U.S. 27 (Exit 178). Photo taken 11/03/11. Interstate 24 runs between the Tennessee River and the L and N Railroad, which disappears at the Lookout Mountain Tunnel through the adjacent rock facade. A diagrammatic sign outlines the forthcoming split with Exit 178 for U.S. 27 (I-124) north and Broad Street (U.S. 11-41-64-72) to Downtown Chattanooga. Photo taken 11/03/11. 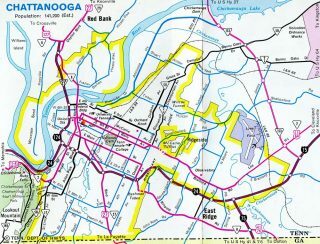 Swinging northward through industrial Southside in Chattanooga, Interstates 24 and 124 separate with two lanes serving each route. Photo taken 11/03/11. Exit 178 departs as a collector distributor roadway for Interstate 124 & U.S. 27 north to Westside, Downtown and Hill City across the Olgiati Bridge and U.S. 11-41-64-72 (Broad Street) at Southside. U.S. 27 south combines with I-24 east to Rossville Boulevard at East Lake/Clifton Hills. Photo taken 11/03/11. Exit 178 leaves Interstate 24 east for I-124 & U.S. 27 north and U.S. 11-41-64-72 (Broad Street). I-24 ends in 7.3 miles at Interstate 75. Photo taken 11/03/11. Passing over the L and N Railroad, Exit 178 separates into single lane ramps for U.S. 27 north and the c/d roadway east to Broad Street. U.S. 27 joins Chattanooga with Signal Mountain via U.S. 127 at Red Bank and Soddy-Daisy as a full freeway. U.S. 11-41-64-72 combine at Tiftonia and parallel I-24 east to Southside Chattanooga. There U.S. 72 ends and U.S. 76 begins, while U.S. 11-64 and 41 turn east through the Highland Park/Oak Grove neighborhood adjacent to I-24. Photo taken 11/03/11. 1951-1963 Peter Rudolph “Rudy” Olgiati, city of Chattanooga web site. “No Signs, But It’s Still There.” Chattanooga Times Free Press (TN), September 2, 1998. William Burmaster, email: “I-124” July 1, 2003. William Burmaster, email: “Fwd: FW: just a question” September 10, 2003. Chattanooga Flag Map (1960). Interstate 50th Anniversary web site http://www.tninterstate50.com/maps/easttn.htm. “Boulevard Proposal Studied for U.S. 27.” Chattanooga Times Free Press (TN), April 19, 1999. “state officials explain their concerns to city planners.” Chattanooga Times Free Press (TN), July 5, 1998. 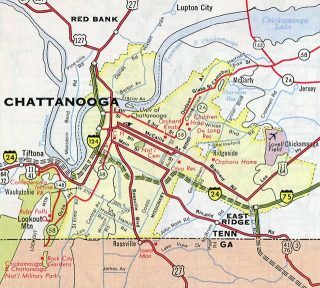 “BIG ROAD REMAKE – U.S. 27 REBUILD FROM OLGIATI TO I-24 ABOUT TO BEGIN.” Chattanooga Times Free Press (TN), November 15, 2015. “Another setback for Olgiati? – Bridge work could stretch through 2003.” Chattanooga Times Free Press (TN), July 13, 2002. Fiscal Years 2007-2009 Transportation Improvement Program (as of 05/23/06) http://www.tdot.state.tn.us/roadprojects/road/default.htm – under Hamilton County: Interstate 124/U.S. 27 were proposed for preliminary engineering and right of way acquisition funding for additional lanes from north of Interstate 24 to south of the Tennessee River Bridge, a distance of 1.5 miles. “SMOOTH SAILING AHEAD – The three-year project to rebuild U.S. 27 led to some rough patches for motorists. But at last, completion is at hand.” Chattanooga Times Free Press (TN), January 5, 2015. “2 Traffic Lanes To Be Left Open Each Way During Construction Of $126 Million Downtown Freeway Makeover Featuring “Monster Wall”.” The Chattanoogan, January 7, 2016. Page updated February 11, 2019.